Funny books - what are your favorites? It's a holiday and I'm listening to kids giggle and giggle as they make cookies. "We forgot the chocolate chips!" they are laughing, as the cookies are already in the oven. Kids love to laugh - they are full of it, at all times of day. 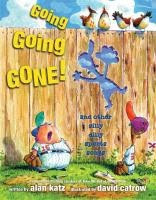 What better way to get kids to enjoy books than to share with them funny books. Easy, right? Wrong. Finding a funny book is much harder than it sounds. Everyone's humor is different - what's funny to one kid is corny to another. But given how sweet the reward is, it's well worth searching out books you and your family find funny. Just to hear those giggles, guffaws and laughs, I'll go out of my way to find funny books. So, my theme for June is FUNNY BOOKS. All month, I'll be searching out books kids of al l ages find funny. 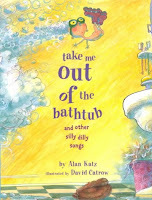 Picture books, poetry books, easy readers, chapter books and novels. Some reviews may be shorter than usual - I'd like to try to share 10 - 15 funny books this month. But I'd love your help! Does your family have any favorite funny books? Please share! Email me, or leave a comment below. He's a pain, but he's darling." 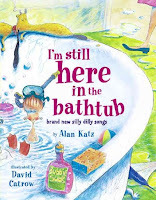 These books will either make you groan or laugh along with your kids. To get a taste of Katz's goofy humor, listen to him sing "On Top of the Bleachers" - an ode to all the things you get while you're at a ball game. The review copy came from our school library. Please note that if you make a purchase on Amazon using these links, a small portion will go to Great Kid Books at no cost to you. Thank you for your support. Who chooses the books you read with your children? In my family, my kids take turns choosing the chapter book we listen to as we drive to school in the morning. But occasionally, truly occasionally, I get to choose the book. "Mommy's turn," I say. We just finished listening to a book that every child needs to read or listen to by the time they finish 6th grade. It's that good. Bud, Not Buddy won the Newbery Medal in 2000 and the 2000 Coretta Scott King Award recognizing African American authors. Carolyn S. Brodie, chair of the Newbery Award Selection Committee said that Bud, Not Buddy "resonates with both zest and tenderness as it entertains questions about racism, belonging, love, and hope." Bud Caldwell has had it with foster homes. By the age ten, he observes, folks don’t treat you like a little kid anymore – they’re likely to set you straight with a blow to the head. Bud lives in Flint, Michigan, and all he has left of his late mother is a suitcase with posters of the jazz musician Herman E. Calloway. Christopher Paul Curtis mixes touching moments with full humor (especially Bud’s “Rules and Things for Having a Funner Life and Making a Better Liar out of Yourself”), as Bud travels to Grand Rapids, Michigan, in search of his father. Set during the height of the Great Depression, Christopher Paul Curtis fills his story with details of African Americans living and surviving during these difficult times. Bud gives listeners insight into life in the Depression, from Hoovervilles to redcaps and Pullman porters. Narrator James Avery creates a charming and sincere Bud. The cast of characters is full of variety, and the occasional jazz tune sets the mood perfectly. I particularly liked the author’s note at the end, where he shares his own family history and different jobs African Americans were able to pursue in the 1930s. This is a wonderful story for the whole family. My third and fifth grader were completely engrossed in it, and my kindergartner even enjoyed it. We listened to a copy from our local library. If you make a purchase on Amazon using the links here, a small portion will go to Great Kid Books at no cost to you. Thank you for your support. I'd also highly recommend The Watsons Go To Birmingham on audio - read by the wonderful Lavar Burton. “I’m bored!” Do you ever get tired of hearing this? “What can I do? There’s nothing here for me to do!” It’s enough to make me pull my hair out. Show Off is the perfect boredom-buster to have on hand this summer. Your kids will love it. You'll love the way it lights their imaginations on fire with a sense of possibility. You’ll spend hours looking through this nearly wordless book thinking of all the cool things you could do. Through bright pictures and very short sentences, sisters Stephens and Mann give simple step-by-step instructions to doing just about anything. You can climb a wall like Spiderman or learn how to make shadow puppets. You can stick a pin in a balloon without popping it and amaze your friends. Do you like science and experiments? Learn how to pull an egg into a glass bottle, lift a friend’s fingerprint like you’re a private investigator, or write with invisible ink. Maybe you want to create some new art. You can marbleize paper like a pro, or you can make your own fake tattoo. This was an instant hit with my kids. They looked at it for hours together, planning and plotting the coolest things to do. They finally decided to make taffy from scratch and loved the whole process – stirring and measuring the temperature with a candy thermometer, and then stretching and pulling it. I loved how visual this is - how it makes kids think about the visual directions, break it down step by step. As we all process so much more on the Web, more of our information will come across visually and not just in traditional reading. Best of all, your kids will love it and you'll have a great reply when they come to you whining, "I'm bored!" or "There's nothing to do!" Are you curious? 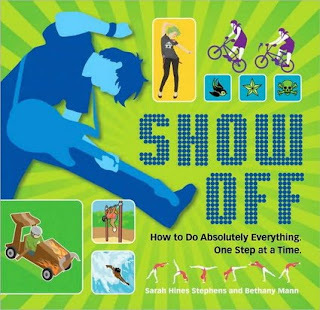 Head over to the great website to find out more about Show Off. You can download nine different activities to try at home. You can also preview Show Off at Google Books to get a feel for the book. Big thanks to Educating Alice for turning me onto this great book, during the Share a Story / Shape a Reader week. It was a hit with her 6th graders. The review copy came was purchased at our local bookstore: Mrs. Dalloway's Books in Berkeley. Do you know someone who can’t sit still? Who is in constant motion? Maybe it’s your own son or daughter, falling off the chair throughout dinner, hopping around while they’re doing their homework. Or maybe it’s someone in your neighborhood. We all know someone who seems like they’re the energizer bunny who keeps going and going. Well, everyone needs to meet Joey Pigza. This is a kid who’s wired, a kid in constant motion, a kid who’s always getting in trouble because he just can’t sit still. 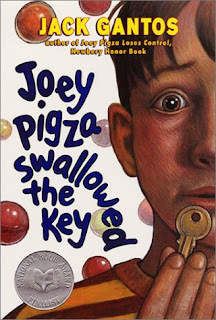 Joey Pigza is one of the funniest, grossest and most touching books I’ve ever read. It falls in my category of “every family should read this”. You’ll go from laughing out loud to a lump in your throat in a matter of pages. Joey understands that he’s different – he’s wired, and something in his wiring works differently than in other kids. No matter how hard he tries, he just can’t concentrate at school, can’t seem to do the right thing. Joey suffers from severe attention deficit hyperactivity disorder (ADHD), and some days it seems like he’s spinning like the Tasmanian Devil.When his teacher asks him to sharpen pencils, he does what she asks him to. But then he starts sharpening chalk, then a Popsicle stick (great fangs! ), and then his finger (ouch!). He takes meds every morning when he can remember, but they wear off by lunchtime. Joey tells his story in an honest, straight-forward manner. Readers quickly see Joey’s good heart and difficult situation. They’ll laugh out loud as Joey literally swallows his house key (which he wears on a string around his neck) and squirm when he pulls it back up, along with a few pieces of spaghetti from lunch. But readers will also cringe as they learn how his grandmother manipulates and abuses Joey. Author Jack Gantos presents a frank view of what it's like to be Joey - so honest that it hurts. But Joey is also a warm, loveable and good-hearted character, and Gantos’ story is full of hope and love amidst the pain. Joey accidentally hurts a classmate and is sent to a special education center for six weeks. His mom returns and becomes a strong advocate for Joey. At the special ed. center, Joey gets the attention he needs; his medication is regulated and he learns how to manage his behavior. Joey leaves the center more in control, understanding his condition and knowing how to take better care of himself. This isn’t an easy story to read, emotionally – Joey’s life is difficult and his situations are harsh. But it is a story that is full of compassion, that will lead to meaningful discussions, and that will mix heart-ache with laughter. If you like this story, you’ll want to read more about Joey in the sequels: Joey Pigza Loses Control; What Would Joey Do? ; and I Am Not Joey Pigza. It's also available as an audiobook. I haven't had a chance to listen to it, but I have read it aloud to a 4th grade class. I think this would make a great audiobook for a family trip this summer. The review copy came from our school library. If you purchase a book using the Amazon links here, a small portion will go to Great Kid Books - thank you for your support. One mark of a great book is that it changes the way I look at the world. As I walked through my garden this weekend, I found myself looking at the plants and listening to the birds in a whole new way - wondering about the tiny creatures that live there, whose live I know nothing about. I found myself wondering about what tiny creatures live all around us, wondering if there are fairies or if the animals have friendships. Another mark of a great book is that I find myself thinking about it as I go through my day, returning to the magical world or relating that world to my own. 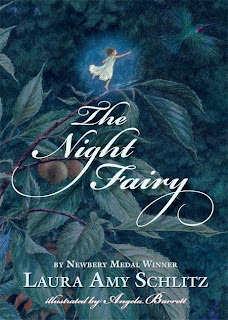 The Night Fairy, by Laura Amy Schlitz, is a truly wonderful, magical book. I just finished reading it aloud with my 6 year old and we both loved it. It stirs your imagination, celebrates a character with feisty independence, and makes you look at the natural world around you in a whole new way. Flory is a brand-new night fairy, just born and getting used to her beautiful wings. Fairies, you see, aren't raised by mothers, but must make their own way in the world. Suddenly, a bat clamps down on Flory, eating her wings before spitting her out and letting her fall to a tree below. Flory, now wingless and in shock, hides in the white blossoms of the cherry tree until she finds an abandoned bird house to make her home. Unable to fly, Flory is forced to make her way in this new environment, becoming a day fairy and making friends with the animals in the garden. Flory is feisty, temperamental and manipulative in the beginning of the story - not what you'd call a good friend at all. Through hard challenges of surviving in a realistic world where predators must find prey to eat, Flory discovers that compassion and generosity help you gain friends, trust and happiness. Written in short chapters illustrated with beautiful full-page watercolors, The Night Fairy works wonderfully either as a read aloud for 5 - 7 year olds, or as an independent reading book for older children. It has exciting and somewhat scary parts that will appeal to readers who want suspense and action (a frightening spider and praying mantis) - I had to keep showing my daughter the picture at the end to reassure her that Flory would have a happy ending. My daughters have long built fairy houses in the garden - imagining little creatures that live under the leaves and come out at night when everyone is away. There is something about the tiny scale that fascinates them - I think it's being able to imagine being smaller than everything else around, hiding and watching the world without anyone seeing you, but still having power and magic. The Night Fairy celebrates that sense of imagination, that sense that things beyond our sensing are real. This is a book that helps them imagine those possibilities, helps bring them to life. Throughout the whole book, my daughter was measuring how big Flory was - at first the size of an acorn. She would measure Flory in the pictures, or try to imagine her crouched on a squirrel's ear. The tiny scale of the book and of Flory was part of its draw. You can read an excerpt at thenightfairy.com and see some of the beautiful illustrations. You can also read a letter from Laura Amy Schlitz where she describes her inspiration for writing this book. It is available as an audiobook on Audible.com - the excerpt sounds wonderful, and I think the book would translate well to an audiobook. But I have not listened to the whole audiobook. A Year of Reading: "I wish I could send this book back to my 9 year-old self. I would have loved everything about it -- its small size, its thick pages, the shimmery end papers, the illustrations, the dedication to ME!!!" The Book Aunt: "The Night Fairy is the best of everything a book should be—an adventure, a fresh take on fairies, vivid storytelling, and a tale in which the main character's experience of becoming will sweep readers along with her. To top it off, this book is physically beautiful, with a design and interior illustrations so perfectly suited to the story that it's hard to believe the illustrator isn't the author." The HappyNappyBookseller: "There is a simple beauty to this story. Each day brings something new for Flory. It was a pleasure to watch Flory navigate her new world and learn how to interact with others." Fuse #8: "I don’t know where this notion that fairies are insipid came from. ... In light of this, Flory may have to become a spokeswoman for anti-fairy defamers. ... Typically fairies are considered girly territory, but there’s nothing about Flory that a boy wouldn’t also enjoy. She’s feisty, a fighter, and she knows what she wants"
Kids Lit by Tasha at the Menasha Public Library: "Schlitz’s writing is laced with magic. This deceptively slim volume holds so much story that it could have been much longer. Instead, Schlitz has written a tightly woven story gilded with wonderful language. The language invites readers deeply into the story, lets them know that something special has been written here, and then sails them off on adventure." The review copy was purchased for our home library. If you make a purchase using the Amazon links on this site, a small portion will go to Great Kid Books (at no cost to you). Just a short note to sadly say that I'll take a one week break from blogging. I am studying for my Master's in Library and Information Science, and it's FINALS WEEK! I have just finished one major project (building a database), and am working on a major research paper. My topic is Building communities: How libraries can be involved. It's very interesting, but I've got a lot left to do! And I'll have a final exam next week as well. On top of that, we're just starting inventory at our school library - scanning each of our 15,000 books over the next week. It's a huge task. So, please send your thoughts, support and chocolate! (just kidding...) I look forward to getting back to my first love: kids and books! I love getting recommendations from students. Best of all, students love sharing books they love. Here is a list of books that 6th graders at our school recommend as the best books they read this year. I will continue adding the WorldCat links for these titles. You can use these links to search public libraries near you. Do you find any titles that you've already read? Try exploring others in the same category. Another good tip is to look at other books that author has written. Have fun! We are huge fans of Rick Riordan. My kids, my students and I all ate up his Percy Jackson series. If you enjoy mystery, mythology and adventure, you'll love Riordan's books. Naturally, we're very excited that his newest book will be released tomorrow. Imagine the Egyptian gods waking up and wrecking havoc on our modern world. Soon, Sadie and Carter discover that the gods of Egypt are waking, and the worst of them--Set--has his sights on the Kanes. To stop him, the siblings embark on a dangerous journey across the globe--a quest that brings them ever closer to the truth about their family, and their links to a secret order that has existed since the time of the pharaohs. The reviews are starting to come in. 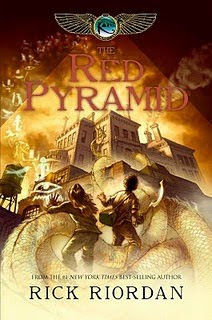 Booklist has given The Red Pyramid a starred review. Carolyn Phelan writes in the Booklist review, "The first-person narrative shifts between Carter and Sadie, giving the novel an intriguing dual perspective made more complex by their biracial heritage and the tension between the siblings, who barely know each other at the story’s beginning. The first volume in the Kane Chronicles, this fantasy adventure delivers what fans loved about the Percy Jackson and the Olympians series: young protagonists with previously unsuspected magical powers, a riveting story marked by headlong adventure, a complex background rooted in ancient mythology, and wry, witty twenty-first-century narration." My guess is that second and third graders are going to love listening to The Red Pyramid, and fourth through sixth graders will love reading it. Riordan has a wonderful skill of drawing in readers with action, suspense and characters they care about. You'll thrill your child if this shows up on their bedside this week! I have not yet read The Red Pyramid. My copy will come from Amazon and Audible.com. If you make a purchase using one of the Amazon links here, a small portion will go to Great Kid Books. Thank you for your support.